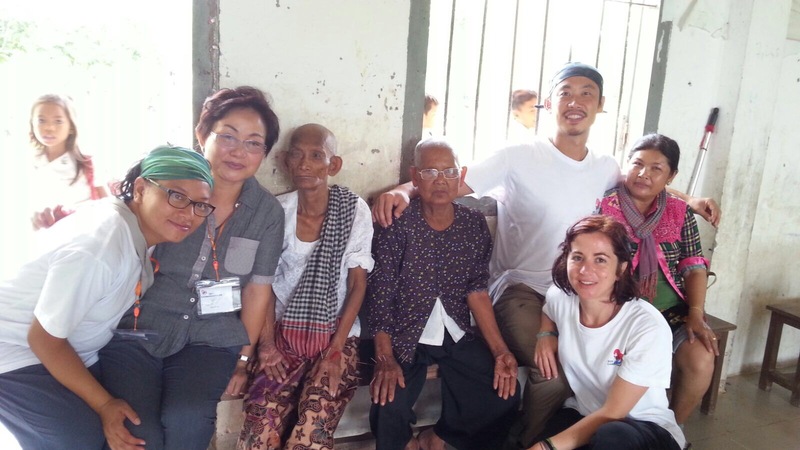 Given this background, I was honored to journey with one of my Si Yuan (SY) colleagues, Dr. Delphine Armand, as part of a humanitarian mission to Cambodia this August. 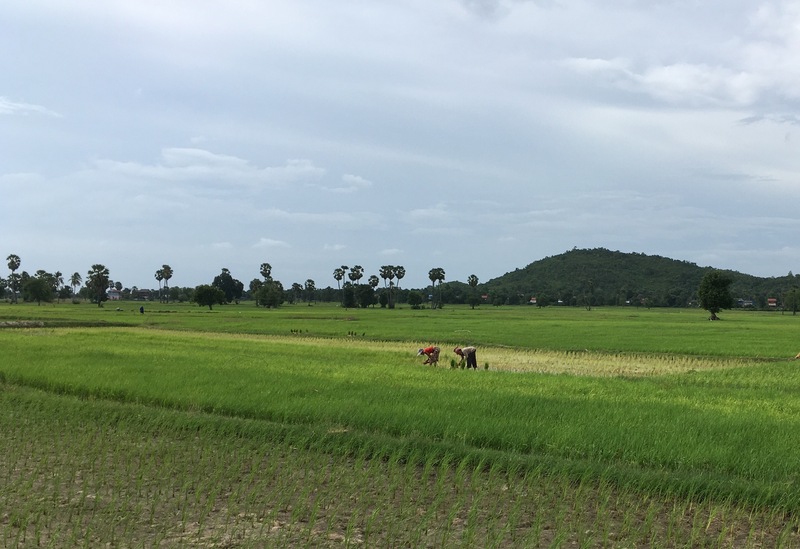 Along with a seasoned team of medical doctors from France, a passionate group of pharmacy students, and an effective support staff, we integrated with rural communities to offer hands-on healthcare. 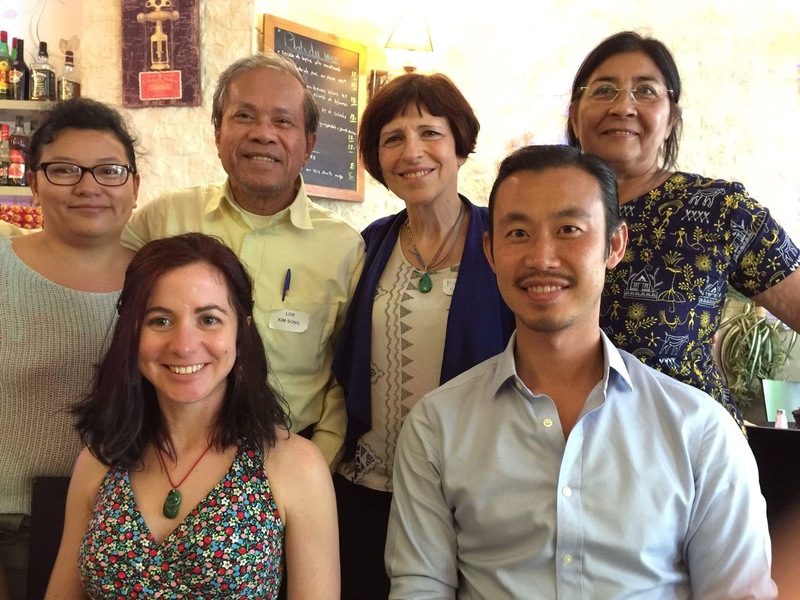 Delphine and I were invited by an attendee of our SYBMA Advanced Track last June in Paris. 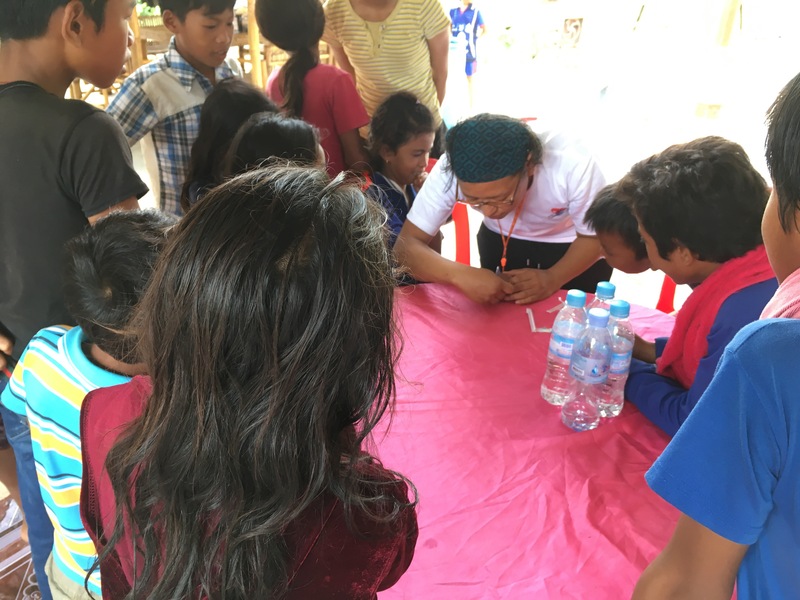 Dr. Kimsong Lor, Mission Chief of SOS Cambodian Kids, approached us recounting how he provided some BMA during the 2015 mission. 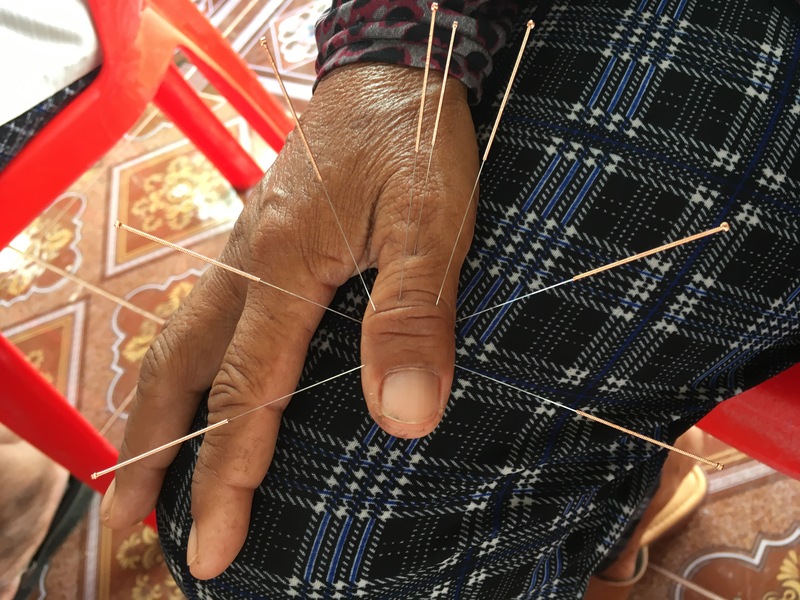 It received unanimously positive feedback and he hoped to expand acupuncture this year. Even with relatively short notice, we readily agreed to aid him and soon planned out logistics. 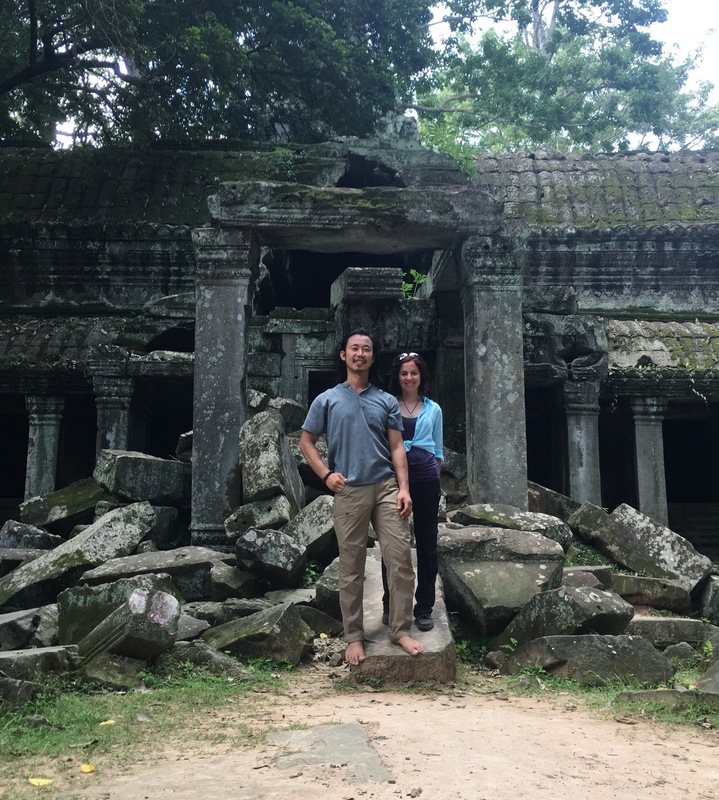 In less than two months, we found ourselves in the kingdom famed for its mystic architecture of Angkor Wat and tree-gripped sandstone at Ta Prohm. After a busy morning paced with 20-30 treatments per hour, we returned to our accommodations for a lunch of fresh local cuisine. 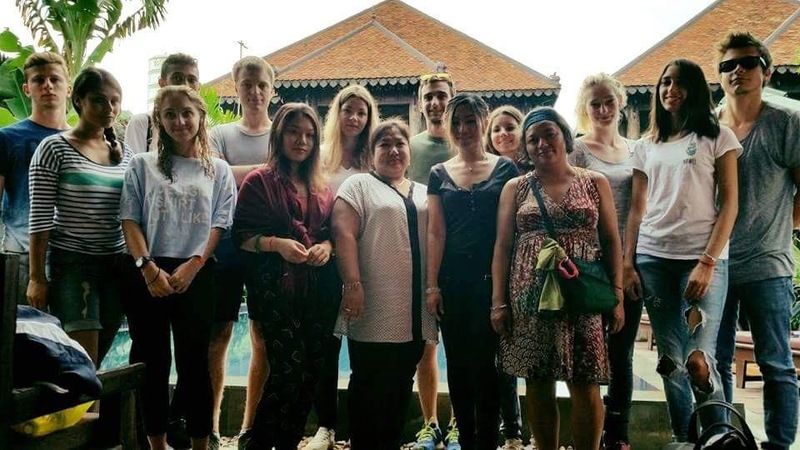 On this trip, I was particularly satisfied to savor the sun-ripened flesh of mango, pineapple, red and white dragonfruit, longan, rambutan, watermelon, plantain, jackfruit, durian, coconut, and, my favorite, mangosteen. Empty bellies refueled, we bumped along the verdant landscape of paddies and palms back to afternoon queues of eagerly awaiting patients. Chhu na? Where is your pain? I imperfectly acquired a few rudimentary words of Khmer, yet hardly enough to navigate symptom locations. Luckily, I was blessed by two adept translators who made my job an order of magnitude more efficient. Kaori and I immediately connected upon our first greeting smile. 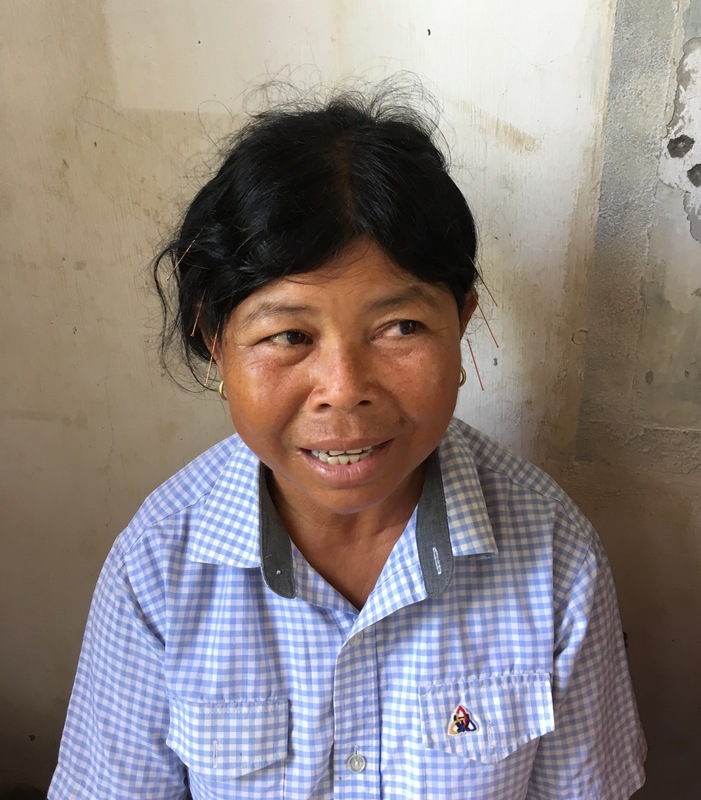 Later on, I learned of her illustrious escapades throughout the world rendering her fluent in Khmer, Japanese, Thai, and English. This common spirit of adventure perhaps bridged our mutual understanding, only I am far less linguistically gifted than her. I realized how lost I was when Kaori took leave. Thus, I was grateful to recruit Chenda once I learned of her Mandarin fluency. It was engaging to switch my mental software and operate in Khmer-Chinese. We developed a smooth rhythm flowing from one patient to another. 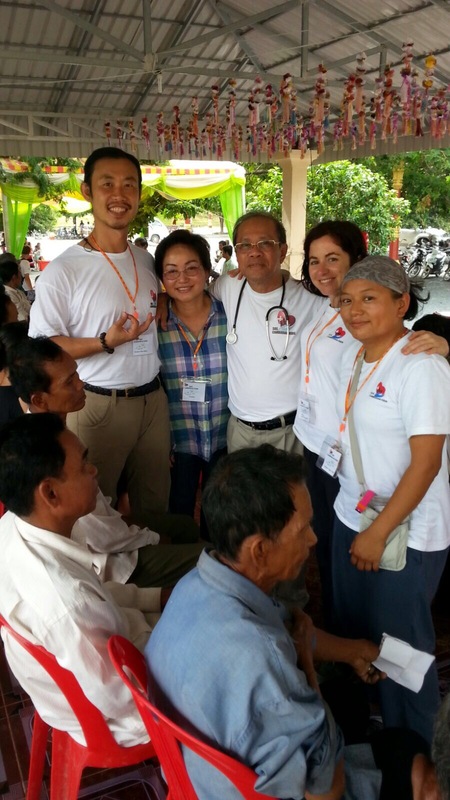 Both Kaori and Chenda were first-hand witnesses impressed by the vast and rapid response to BMA. They even expressed interest in studying acupuncture. We attained a 95-99% response rate in reducing the severity of various headaches; dizziness and vertigo; eye problems; sore throat; pain, tingling, numbness, and inflammation in the neck, trapezius, scapula, shoulder, elbow, wrist, fingers, hip, buttock, knee, ankle, toes, thoracic, lumbar, and sacral vertebrae; sciatica; arthritis; gastric and enteric discomfort; uterine cramping; shortness of breath; hypertension; anxiety; insomnia; etc. As day paled to dusk, despite the steamy climate peppered with nocturnal mosquitoes and the abrupt yelp of geckos, we were still going strong and motivated to help as many villagers are we could. Hence, after just the first day, we went viral. Patients spread the word about our services and some of their referrals trekked from hours away to see us. 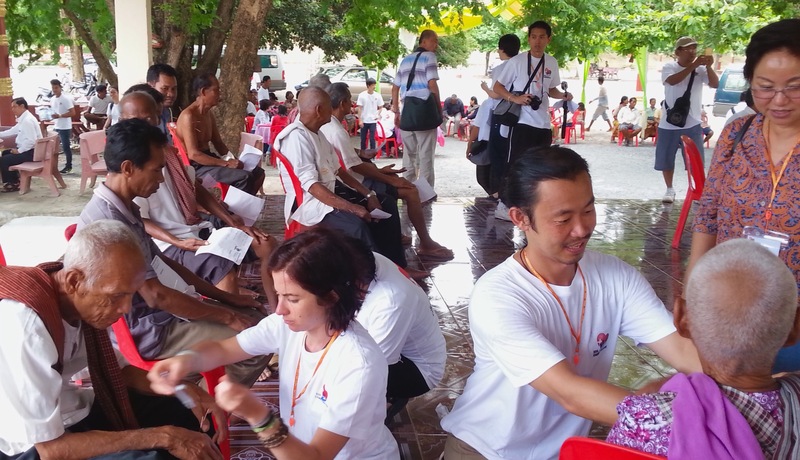 Even the medical doctors, pharmacy students, and tireless drivers were keen on having a try. They became some of our most dedicated and curious clients. Delphine took time to answer their questions about BMA. We were glad to ensure the health of our diligent, focused, and selfless coworkers. This included several victims of swimming pool mishaps. All in all, with official ones on the record plus numerous impromptu sessions we did on vans, boats, and sofas, in lobbies, gazebos, and hotel rooms, we completed around 800 treatments. 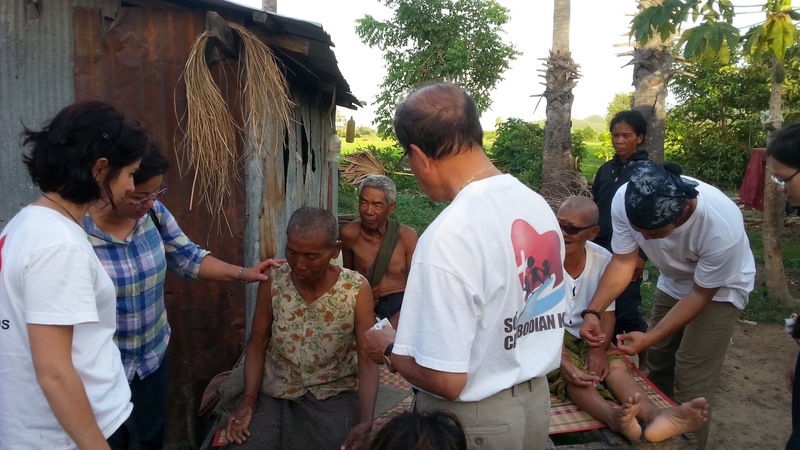 It was a reciprocal gift to give relief to so many people. We had no illusions for a lasting cure given our limited availability. But we were inspired to make whatever difference our efforts catalyzed. 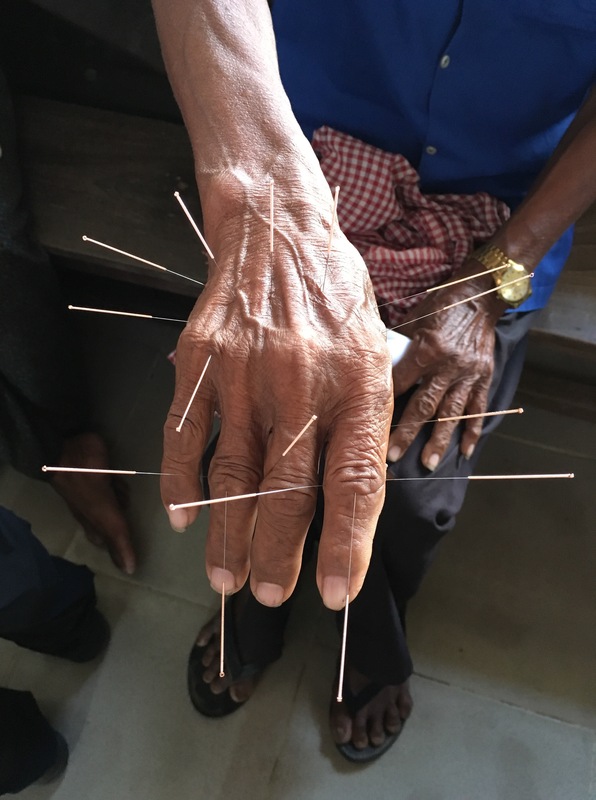 The high volume also allowed us to further research BMA point selection based on the Acupuncture 1, 2, 3 process codified by our late Grandmaster. Besides refining the precision and flexibility of our Imaging and Mirroring, we successfully experimented with Seasonal Balance, Five Element, and Twelve Magical Meridian Strategies from our SYBMA Advanced Track curricula. I will admit, being somewhat ambidextrous, I even honed my two-hand simultaneous insertion technique! A mere three days before flying out from San Francisco to Phnom Penh, I was driving in Northern California near the famed Mount Shasta. It is a majestic geography that never fails to touch my soul. As I was absorbing the view and vibe, suddenly a big semi-trailer truck struck my vehicle. Instantly, I was rotated sideways and pushed along the highway for hundreds of feet until our combined momentum dissipated. Perhaps due to my training, I was calm and waved to the driver who did not see me prior to impact. There are countless alternate trajectories that the chaos of physics could have unfolded to leave me or others in worse shape. Who knows why and how I did not flip or burn or break or die. But as friction seared rubber and melted metal, the interminable asphalt summoned my flesh and bones towards a similar fate. My past did not play before my mind’s eye. Only total presence of the present bathed me. It is ever here, there, everywhere. Even given the persistent stress of mundane tasks. Even during the stark violence of a car accident. Even while overwhelmed by illness. Even when facing impending death. Even as we spin and spiral through spacetime. There is no name yet infinite names to call this. Silent remembrance is enough. I want to specifically mention Hana Yu at Helio USA for sponsoring our mission with acupuncture supplies. This included thousands of needles, ear tacks, boxes of alcohol swabs and sharps containers. For those who are curious, we primarily used their C&G PLUS Cluster Pack needles (0.25 mm diameter and 40 mm length). Please support this generous company by sourcing your clinical tools and equipment from them. My gratitude to our mission leaders, Dr. Kimsong Lor, Madame Lor, Bophanara, Kong Kim; to my Western medical colleagues; to the students of Faculté de Pharmacie de Nancy and members of AHNEP: Charlyne Brakta, Justin Pernot, Shadé Floquet, Mathieu Masalski, Ilyès Loutfi, Nawel Loutfi, Quentin Wolff, Anthony Grandmaire, Orianne Moulin, Emeline Mathieu; to our energetic cheerleader Martin Hurel; to Tony Lor who painstakingly filmed and edited a documentary video of the mission; to my brilliant translators, Kaori Aochi and Chenda Kim; to the capable and lovable Dorina Hua, Phkar Malis, and Maika Hong; to the warm company of Anne-Tévy Ung and Pauline Deplaix; to our friendly drivers with long-distance stamina; to our masterful cooks and the gourmet meals they crafted. Last but perhaps greatest, I bow to the spirit of our Shifu 師父, Dr. Richard Tan, not only for blessing us with his lineage teachings but also bringing Eileen Han, Delphine Armand and I together. I humbly dedicate any merits we have gained from this mission to him. Beautiful Paul! Thanks for coming to Cambodia! Thank you, Lapy! Glad to do such great work with you there.